Oh the horror, is right! 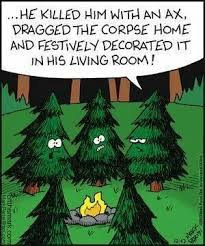 Sharon; I don't suppose this will stop people cutting down trees for Christmas. I'm glad I have a plastic tree that I reuse year after year after year..
only slightly confused; trees have feelings too. Happy Elf Christine; to me it is twisted to cut down a pretty tree just to decorate and use it for a few short weeks then throw it away. Arkansas Patti; A tree brain, I like that. I'm glad I have a reusable plastic Christmas tree. See, trees do feel pain. Andrew; I believe they do, but aren't able to express it as we can. I always need things 'splained to me. I thought he meant another tree was the perp. Joanne; with crimes against nature, Man is always the perp. The aspens quake when they hear that story! If that's not bad enough...think about all those poor chickens that have lay eggs of all colours, sizes and packaging at Easter!!!! Lee; but chickens will lay eggs anyway and the colouring is done by humans. So that's not as bad. Not a good story to tell at Christmas haha. sizes and packaging at Easter!!!! We have an artificial tree ...and the way the weeks are going it will soon be coming out of its box!